Happy Thorsday! Yes, it’s not Thursday when this goes up, but I wrote most of it on a Thursday. Plus it’s always Thorsday. 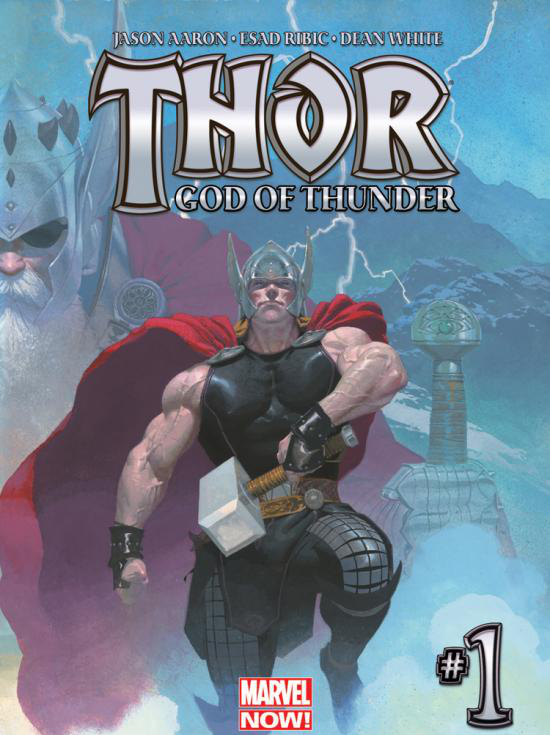 It should be no surprise by now that the current recommended read is a Thor title, specifically Thor: God of Thunder by Jason Aaron and Esad Ribic. This particular title was born from the 2012 Marvel NOW! initiative, when Marvel Comics restarted several comic series and shuffled their creative teams. It’s not a story reboot like DC’s also-recent New 52. Just a refreshing of talent. In Thor’s case, that means handing the reigns over to Jason Aaron, who before then had written for Wolverine and Ghost Rider and created the well-regarded Vertigo Comics series Scalped. I generally enjoyed the previous Thor run by Matt Fraction, but Thor and Jason Aaron are a match made in Asgard. 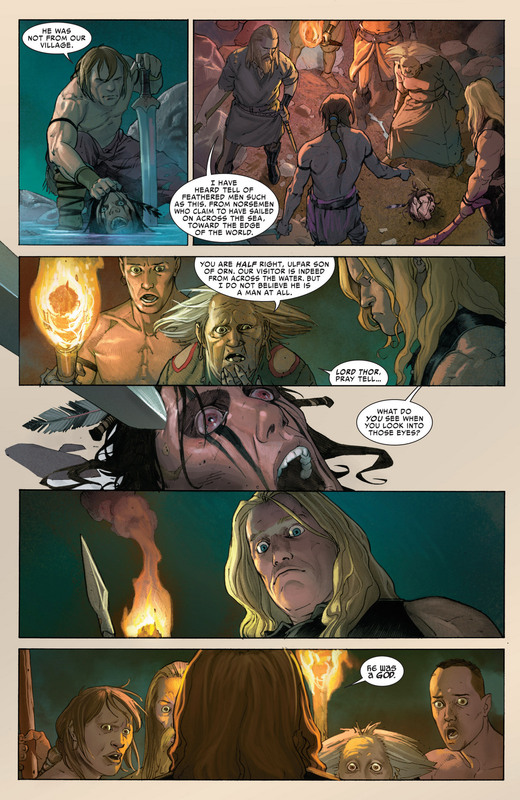 In the story, Thor encounters the handy work of a sadistic killer of gods. This God Butcher, Gorr, has a blood vendetta against all deities of all worlds and times, making it his life’s mission to kill every last god in existence. His unholy goal has taken him across all of time and space, encountering Thor from different eras: Thor of the past, the young viking god of the 900s full of arrogant bravado untempered by his modern humility; Thor of the future, the king of a barren Asgard for millennia wielding awesome power and also regret for his past failings against the God Butcher; and of course Thor of the present, the avenger god bound to protect those in need, including his fellow gods. As of this writing, this comic series is up to issue nine. The first two arcs – The God Butcher and Godbomb – are really two parts of a combined story. The first arc, The God Butcher, tells of how these Thors from different times all relate to Gorr the God Butcher. The second arc, Godbomb, leads into an action-packed battle between Thor and Gorr across the cosmos. One of the first aspects that stick out about this book is the art. Esad Ribic’s pencils and Ive Svorcina’s colors detail a fantasy swords-and-sorcery tale. This Thor, while still quite godly, isn’t as shiny or ornate as expected from comic superhero Thor. The color palette is more earthy and subdued, not as bright and cartoony as a typical superhero comics. From the art, you can tell this isn’t a tights and flights story. It’s a mythological epic. This Thor is flawed and fun. He’s gets frustrated. He’s not the brightest, but he tries. He loves to drink and fight. This is all the present day “humble” Thor. Young Thor is even more rambunctious. Jason Aaron is doing a great job showing us that this is a viking god. Despite being a tried and true hero among heros, an Avenger no less, Thor still enjoys his vices – getting drunk and swinging his hammer around (in multiple senses of the phrase, for you Dr. Horrible fans). This book is such a visceral thrill, reading about Thor’s escapades across the stars to stop a monster powerful enough to slay gods, and that is a phrase with no exaggeration. The sense of scale is phenomenal. At one point, Thor sails across billions of light years on a viking sailboad, as if it were merely across the sea. He commands the weather, calls down hell-fire, and mends planets with lightening. He even answers prayers of alien worlds in need of rain. This Thor is truly a god of thunder that could go toe-to-toe against Superman on Clark Kent’s best Silver Age day. When I pick up my comics from my hold box at my local shop, Thor: God of Thunder is one of my most anticipated books of the month. It’s enjoyable on so many levels. Jason Aaron’s writing is full of reverence for Thor’s character and divinity, as well as wit on how to play that off in his personality at each stage of the character’s life. Esad Ribic’s art perfectly matches the high fantasy feel of the story. The action and mystery and intertwining time lines fit smoothly together. I believe I did an OK job describing the story, but I doubt I came close to saying how good this series really is or how much I love it. If you enjoy comics or even just like Thor in the recent Marvel movies, give this book a shot. At only nine issues in, it’s easy to catch up and is completely worth it. Do you have a comic to recommend? How about a favorite Thor story?